Fluidity, balance, grace, power, calmness in the face of a challenge—all integral parts of both surfing and yoga. 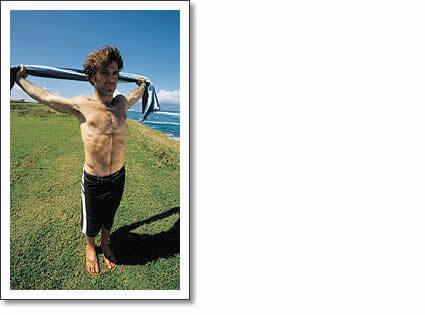 More and more surfers are discovering the power of yoga to enhance their surfing ability. One of the main places that we can loose our flexibility quickly is in the shoulders. Doing the following 10 minutes of shoulder openers can not only increase your paddling power, but also extend the lease on your body. Enjoy. Hold a towel, or a strap, or a t-shirt with both arms. Choose a width that is comfortable. Slowly draw the towel over your head, so the arms are behind your back. The body will want to find the path of least resistance by tilting the rib cage backwards. This is because the pecs attach to the ribs. Contract the abdominal muscles that attach from the pelvis to the rib cage to bring your front ribs down in the direction of your pelvis. In other words, don’t arch your back. Breathe deeply for one minute. Bring the left arm across the body and reach the left arm to the right. Bend the right arm and press the inner right arm (elbow crease) into the left elbow. Straighten through the left arm and slightly press it against the right arm. Make the arm as long as possible by subtly moving it in two directions. Breathe into this one for 45 seconds on the each side. Press both feet down the ground, spread through the toes to really root the feet. Let the right hand hold the left wrist. On an inhalation, reach upwards first through the hands in order to get the body and spine as long as possible. Don’t “shrug” your shoulders. As you reach through the arms, draw the shoulder blades down the back so you do not create tension in the traps. Stay aligned. The right shoulder rolls under, the left shoulder rolls back. The Right side of the pelvis presses forward and the arms reach behind you slightly. Relax and breathe for one minute and repeat on the next side. Stretches deltoids, triceps and chest. Draw the left hand behind the back towards the shoulder blade. Palm faces out. Reach the right hand skyward and turn the palm towards you. Bend the right arm and clasp hands. Clasping hands may not happen if you have logged up a lot of paddling hours in your life, so if you need to, hold a towel with your right hand, dangle it towards the left hand and then clasp. Don’t worry, your body will open more in time. Lift (press) the right elbow up and again take any excess arching out of the lower back by bring the lower front ribs towards the upper front pelvis. 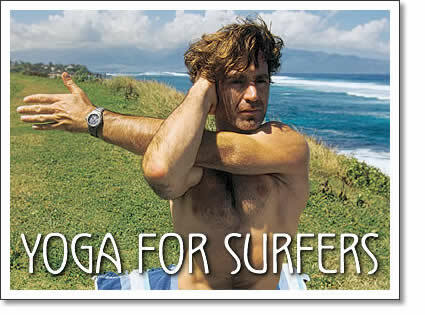 Tofino yoga for surfers sequence, a ten minute shoulder opening routine for better paddling ability while surfing in Tofino.